Monday morning I peeled myself out of my motel bed and got set to get out of town. I never really felt like my stay in Charlottesville had broken my momentum, but every hour I stayed just made it that much harder to get riding again. The night before I had sorted out about seven pounds of stuff I don't think I'll need at all on this trip, and I shipped all that back to Colorado. I also picked about seven pounds of stuff that I still think I will need, but just not for the next few days. That stuff I shipped ahead to myself and should pick up on Thursday. Today's ride was a short 30 miles to Afton, but it also brought me the first hard climb of my trip. 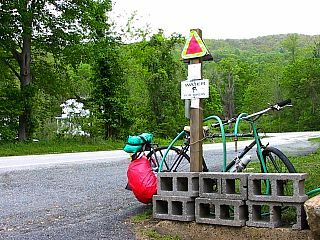 Some westbounders say that the climb to Afton is the most difficult of the entire 4,350 miles. The climb was made worthwhile, however, by the fact that the Cookie Lady lives in Afton. June Curry, age 81, is better known to cyclists as the Cookie Lady and has been a legend on this trail since 1976. When the first groups of Bikecentennial riders came through town, June and her father began offering them water and cookies to refresh them as they passed. Since then, Mrs. Curry has greeted over 11,000 cyclists and has a whole house dedicated to memorabilia that cyclists have sent her. When I got to Mrs. Curry's house she was away but had left a note to cyclists advising that she expected to be back around 7:00. I sat down at her picnic table and ate some of the cookies she had left out while I started practicing on my harmonica. Shortly, she arrived and she seemed so delighted to meet me that I couldn't believe I was just one of the thousands she has said hello to. After I helped her carry her groceries into her home she gave me a tour of the "Bike House". There were at least four large rooms where the walls were covered from floor to ceiling with newspaper clippings and postcards from cyclists, as well as a kitchen stocked full of groceries for hungry cyclists to eat. We talked about her life until dusk was fading, I watched her get safely back to her house, and then I settled in. I hadn't been expecting a hot dinner tonight, but the food in the kitchen was there for the taking so I made myself a box of macaroni and cheese. 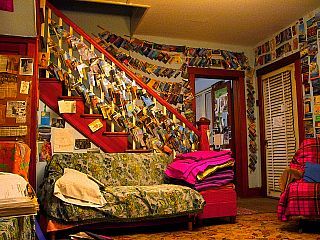 After leaving a donation in her "cookie jar", I laid down on a couch to read some of her scrapbooks until I drifted off beneath two blankets.